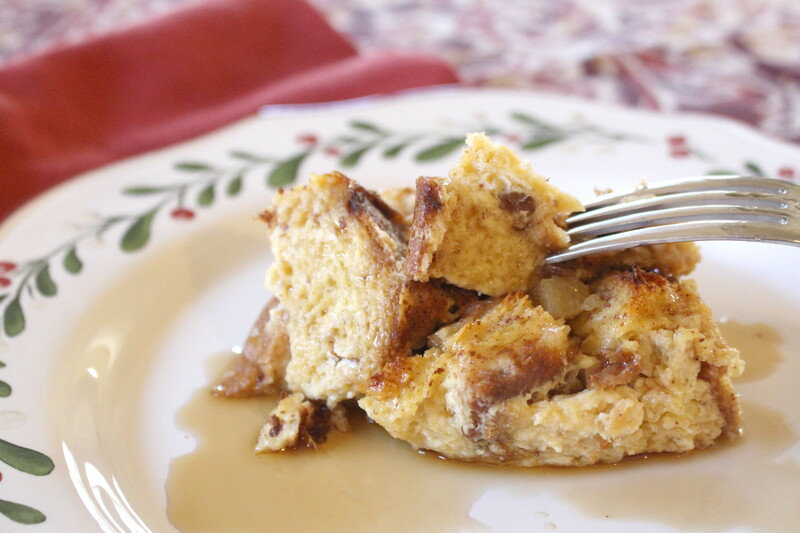 Holiday food traditions are a treasured part of our family celebrations, and Panettone-Eggnog Overnight French Toast has become the decided breakfast favorite on New Years morning. It is a heavenly blend of classic Italian Panettone bread which soaks overnight in a mixture of eggs, rich eggnog (from local Clover Stornetta Farms), and bourbon vanilla. Since I am Italian by marriage it seems fitting to serve this casserole as a tribute to my husband’s ancestral homeland, but you need only appreciate great food to fall in love with this dish. 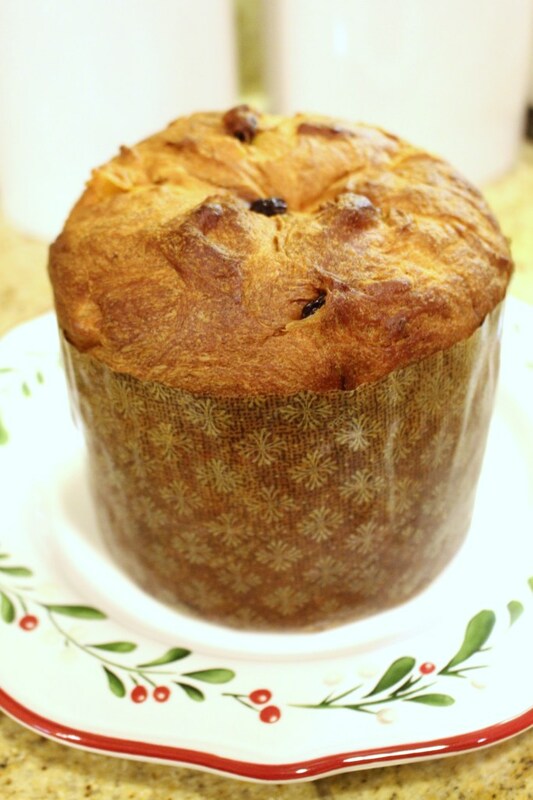 Panettone is a traditional holiday Italian sweet bread infused with candied orange, citron, lemon zest, and raisins. It is widely available in specialty stores (including Trader Joe’s) and bakeries during the holidays, and generally comes wrapped in a cylindrical box. It has a lovely aroma and texture that pairs perfectly with spiced eggnog in this festive French toast recipe. Plan to prepare and refrigerate this breakfast casserole the night before New Years so the bread has time to absorb all the liquid goodness. In the morning, simply pop it in the oven and bake to puffed perfection as you relax and enjoy the parades on TV. Serve it warm with a generous drizzle of real maple syrup for a flavorful entree that will dazzle guests and become an instant family favorite. A word of warning: this recipe does not skimp on calories, but it’s absolutely worthy of a holiday splurge. From my home to yours, may your New Year be filled with good health, abundance, and joy. Mangia! Butter a ceramic or glass 9X13 inch casserole dish. Cut ¾ of Panettone loaf into thick slices, then cube. Fill buttered baking dish with cubed bread. In a separate bowl, combine beaten eggs, eggnog, milk, vanilla, and spices, mixing well. Pour evenly over the bread cubes, saturating the bread. Cover and refrigerate at least 12 hours or overnight. In the morning, preheat oven to 350. Remove cover from casserole and bake on center rack for 40-45 minutes, or until puffed and golden. Serve with maple syrup. 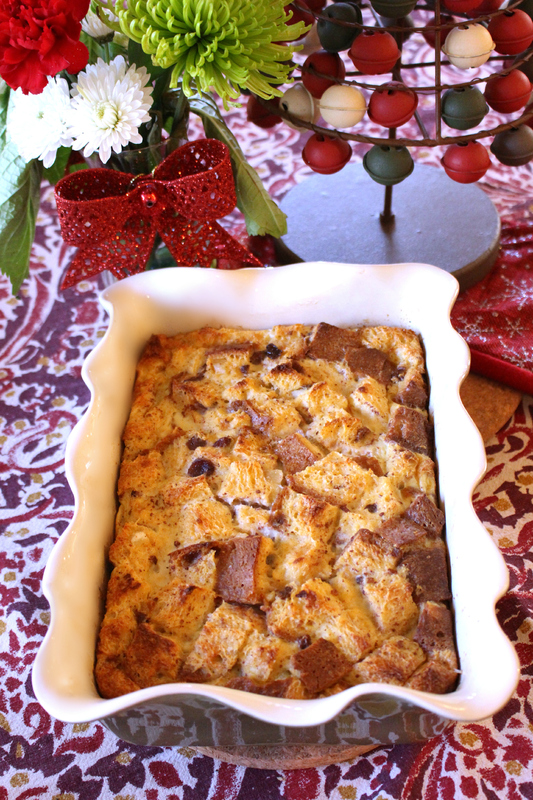 What a great way to use up some of the panettone. Looks delicious.